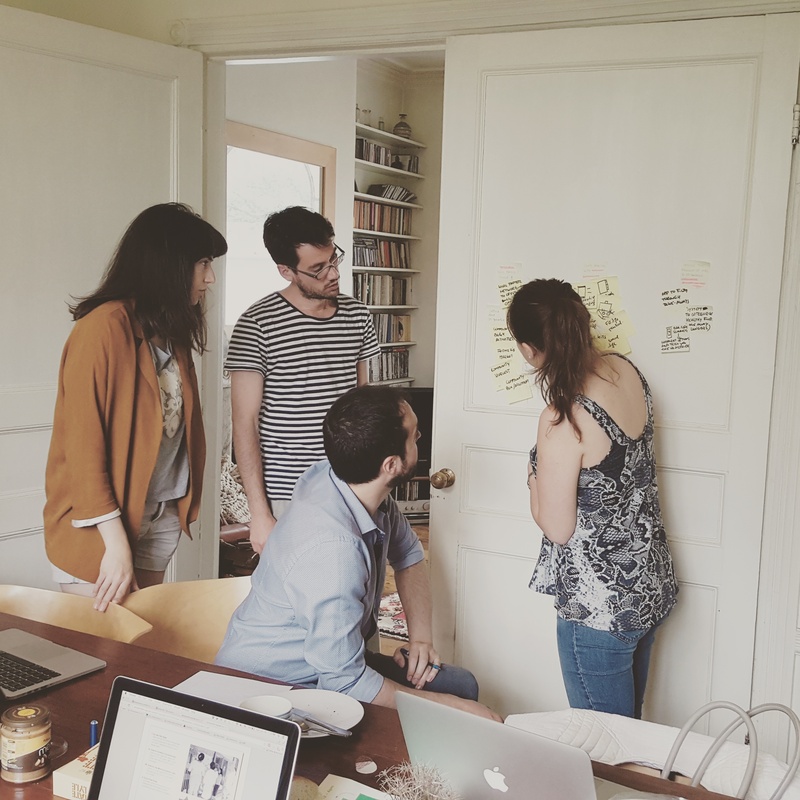 Reflections on a Human Centred Design online course. A while ago on this blog, I made a promise to actually take up on a MOOC (massive online open course), and document my experience. Although I consider myself to be self-motivated and an independent learner, it has been 5 years since I did any kind of formal learning and sometimes life gets in the way and the next thing you know all motivation, engagement and direction is lost. As a result, my previous experience with an online course was not very successful. Like thousands of others I signed up for a Coursera course and very quickly realised that I didn’t have the time to spend on the course, so I silently (and embarrassingly)dropped out. So, a year later, I found myself registering for another online course. This first part is easy- with a click of a button you can register your interest for a plethora of courses (from Macroeconomics to Greek Mythology) and then you can forget all about it….Until you receive an email to welcome you to the course with reading materials and resources and a long list of instructions for your tasks for the first week. So…I placed a virtual pin (labelled ‘participant’) on a digital world map, alongside 13,000+ fellow students scattered around the world and that was it. I was enrolled in a MOOC. The course I decided to take is called Design Kit:The Course for Human Centred Design and is designed to run for 7 weeks. This free course is offered by IDEO.org and acumen fund and aims to introduce you to the concepts of human-centred design and support you in creating innovative and effective solutions for social change. The course claims to be ideal for people who are brand new to human-centred design but can also be taken by people who wish to hone their skills further. The course is hosted on NovoEd, a MOOC platform from Stanford University, that differs from others (similar to Coursera) in that it provides the technical platform for limited-entry , closed courses , such as Stanford’s executive education programmes. For each class, there were a variety of materials to read, and very short videos to watch. This was very different to my previous experience with an online course where I had to watch a talking head video lecture for an hour. For each class the deliverables were outlined from the beginning of the course alongside submission details and deadlines. As part of this course, it was recommended to work with a group of 2-6 people, what they refer to as your ‘design team’. This for me, was the highlight of the course and the reason why I managed to complete it and not give up. It took a couple of minutes to go through the discussion forum to check whether there are any London teams that still need members. Once I committed to being part of a team, I felt accountable. 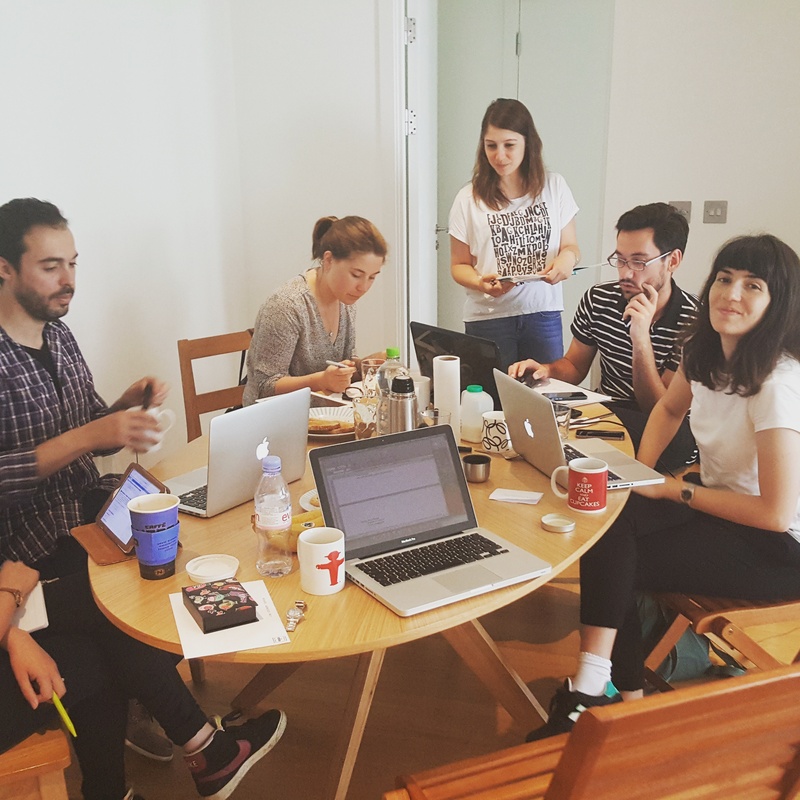 We formed the team online on a Friday afternoon and organised to meet on a Sunday morning to work through the activities of Class 1. The commitment of each of our team’s members is definitely what I have found the most interesting and inspiring part of this experience. For 7 weeks, every single one of us did their homework, communicated online throughout the week on the team’s discussion forum, and managed to wake up at an ungodly hour every Sunday morning to meet up for a 3 hour design workshop. 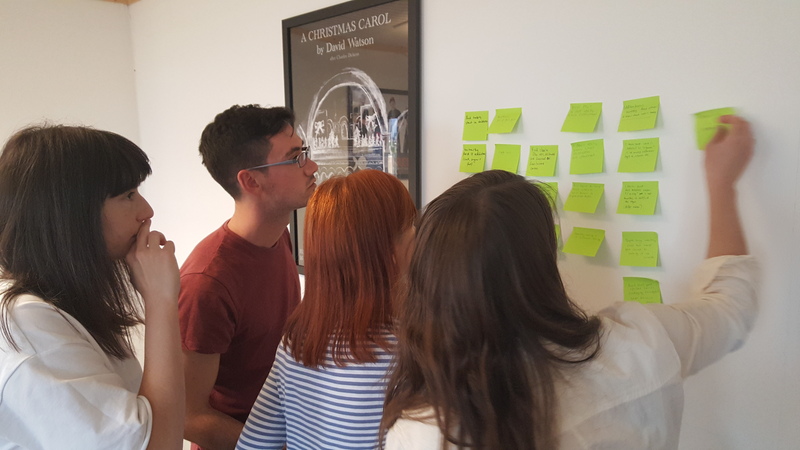 The idea behind the assessment for this course it based on applying the human-centred design process to one of the three pre-crafted real world design challenges that were provided by the course (you are also allowed as team to pick our own design challenge). We had to submit our work online and we were also required to peer evaluate other assignments and provide feedback for the work of other teams. Subject to course completion (of all assignments) you can receive a statement of accomplishment (we submitted the last piece of coursework this morning, so I will update this post with a picture of my statement of accomplishment once I receive it). As of this morning, I have now completed the course. I have not yet received my certificate of completion but I don’t feel that I need it. I felt a great sense of achievement and empowerment when we submitted the final piece of coursework. This made me think that the success of online courses and MOOCs is very hard to measure. Even though success is heightened by the high drop out rates reported in research, I am not entirely convinced that completion equates success. No one can deny that MOOCS are changing the way we engage with formal education systems. On one hand they allow people to take courses from well established institutions (and private organisations like in my case) . One of the things I have definitely enjoyed, is working in a team. I am not confident I would have completed this course if it wasn’t for the rest of the team members, which makes me think how important is the human element for my learning. The face-to-face meetings were integral to my overall experience and even though I enjoyed the asynchronous tools that we were afforded with (chat, video hangouts, discussion forums)- these are not substitutes to face to face meetings. My only criticism would be the peer-evaluation part of the course- not because I don’t value peer evaluation as a integral part of learning, but because I am not sure I was implemented very well. Even though I understand the economic reasons behind the decision to not hire a large pool of support tutors to evaluate our assignments, I am still doubting the trustworthiness of the peer review results. How can the performance of a novice be judged by other novices? And how do we determine what constitutes a true score? I think I would have preferred a model that allowed for both reviews from fellow students as well as tutors and perhaps better models of peer assessment in MOOCs are required. I would recommend this course to people who want to find out a bit more about human centred design. This might include design students who want to improve their skills by working in a hands on team environment, or people who would like to get involved in the UX industry, and need to work on their portfolio. 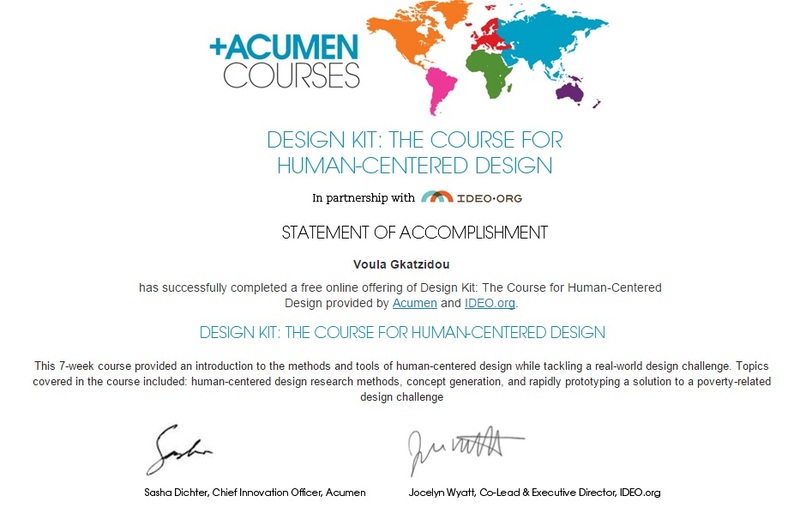 I would also recommend this course to professionals who would like to learn more about human centred design- you can complete this course by working around your day job schedule.